The Lepidico Board has approved full commencement of a DFS, once funding is secured. The DFS is expected to be completed within nine months of starting the full work program. A Pre-Feasibility Study (the Study) to evaluate the Phase 1 L-Max® Project (the Project) has been completed by MinMet Services Pty Ltd. The Project is based on the L-Max® process technology which extracts lithium from lithium bearing micas to produce a lithium carbonate product. The Phase 1 Plant is a demonstration scale plant designed to produce 2,000 – 4,000 tpa of battery grade lithium carbonate. The plant can also produce valuable by-products. A DFS for the Project is planned to be completed in 2017, with project implementation commencing early in 2018 and first production in 2019. L-Max® is a hydrometallurgical process which uses low cost and readily available mainstream chemicals such as sulphuric acid, lime and limestone to extract and recover lithium from lithium containing micas. Lithium micas are abundant across the world, but are not typically treated due to a perception that they are uneconomic, when compared to conventional hard rock spodumene or brine deposits. The flowsheet is based on an extensive body of data from both batch testwork as well as continuous mini-plant testing of the L-Max® process. Strategic Metallurgy, located in Perth, Australia, have undertaken the testwork and flowsheet development. Strategic Metallurgy have a record of accomplishment in successfully developing and applying new process technology for the mining industry. The L-Max® process flowsheet is designed to be robust and can treat a variety of lithium mica’s. Modifications and/or additions to the flowsheet can be made to allow flexibility in whether to produce one or more of the by-products associated with the L-Max® process. The potential by-products include sodium silicate, caesium, and rubidium (as formates), sulphate of potash (SOP), tantalum or tin concentrate, gypsum, and sodium sulphate. Equipment selection for the Phase 1 plant has been made to ensure that the equipment used is suited for use in a commercial L-Max® plant. The Phase 1 plant equipment will represent a smaller version of the equipment selected for use in a larger Phase 2 plant, with anticipated production capacity of 15,000- 25,000 tpa lithium carbonate. This is intended to minimise the scale-up risk of using equipment that is unsuited to larger throughputs. The path from batch testwork to commercial operation incorporates several development milestones. The construction of a commercially viable demonstration plant prior to a full scale commercial operation is a critical step in reducing project risk and optimising the process. 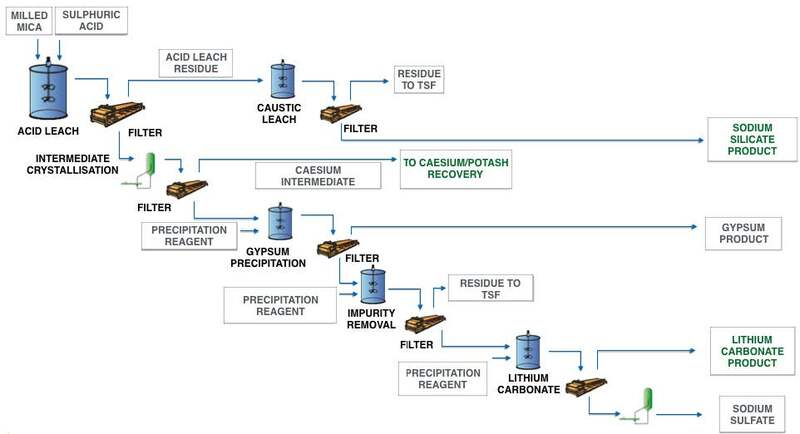 The L-Max® process flowsheet is shown in Figure 1, below. The testwork completed has shown the L-Max® process to be technically viable for several feed sources. Due to the abundance of lithium bearing micas several feed sources and several locations for the L- Max® plant have been evaluated in the Study. The key drivers for location selection include: the availability of the major process chemical consumables at competitive cost, proximity to by-product markets and logistics costs in general. The L-Max® plant would receive mica concentrates of a suitable lithium grade and quality. The mining and concentrating processes would be owned and operated by a third party and the concentrate would be purchased by Lepidico “Free on Board” (FOB) transport at the mine gate, although this arrangement will be finalised in the feasibility study. The L-Max® plant could process concentrate from more than one source however a specific location has been selected in the Study. The L-Max® plant is planned to be located in Kenora, Ontario, Canada, a location which provides favourable economics over the other locations evaluated. The PFS has demonstrated that lithium bearing mica can be economically transported to Kenora from existing mining operations overseas which currently mine lepidolite mineralisation. It is planned that the L-Max® plant would receive concentrates from two of those operations and potentially from the deposit of Separation Rapids (located 80 kms to the north of Kenora) where suitable mineralisation has been identified, tested and found to be amenable to the L-Max® process. A review of project permitting requirements has been undertaken for Ontario which indicate that permitting is not on the critical path of the project development schedule to achieve first production in the second half of 2019. Kenora is a town with a population of 15,000 with well-established services. It is located approximately 200 kms east of Winnipeg, Manitoba. The town has excellent transport connections to other parts of Canada and the United States. The Minnesota border is about 215 kms south via road. The Canadian Pacific Railway passes though the town and the port of Thunder Bay on Lake Superior is 489 kms to the east with access to the St Lawrence Seaway. Bench scale and sighter testwork has been completed on several potential feed sources. The results discussed here are for one specific source with moderate caesium and tantalum grades but the testwork has produced consistent results. A lepidolite sample containing approximately 40% mica and 1.0% lithium (2.2% Li2O), was subject to a series of batch tests to assess the amenability of the run of mine mineralisation for lithium extraction and recovery by L-Max®. Concentration of the micas occurs through simple rougher flotation at a coarse grind size and with rapid flotation kinetics. Flotation of the sample achieved a lithium recovery to concentrate of 96% and produced a high-grade mica concentrate containing 2.1% lithium (4.5% Li2O) that was used as feed to the L-Max® process testwork. The leach liquor was subjected to a series of impurity removal and precipitation steps to produce a >99.88% Li2CO3 product. The leach residue as reacted with caustic soda to produce sodium silicate solution at a SiO2:Na2O ratio of 1.6. There is also potential to recover both caesium and rubidium into a formate solution. The testwork completed on various mica samples, has resulted in recoveries greater than 80%. Results of the L-Max® testwork are presented in Table 1. The cost has been developed based on a comprehensive equipment list. Equipment pricing from up to three vendors has been obtained. Many of the bulk commodities for installation have been estimated using material take offs. The infrastructure scope is limited due to the location in the town of Kenora and the direct access to utilities including power, water, natural gas, and transport infrastructure. The plant is planned to be housed on a vacant industrial site in Kenora, with direct access to the transport network. The capital cost of the process plant can be reduced by approximately $5M by eliminating the SOP circuit. The accuracy of the estimate is -20% to +30% and meets the requirements for a pre-feasibility study. Sustaining capital has been estimated at US$1.1M pa which is largely required for residue disposal. A closure cost of $1M has been included to provide for removal of the plant at the end of the project life. As previously discussed the L-Max® process has the potential to produce several by-products alongside lithium carbonate. The annualised Phase 1 process plant production rates of those products are shown in Table 5, together with the price assumptions for each project. Market research studies have been completed for all major products which support the assumptions used. The price for the sodium silicate has been sourced from the PQ Corporation website for a comparable quality product to that produced by L-Max® but discounted by up to 15% in the first three years of operation to allow product quality to be fully established. 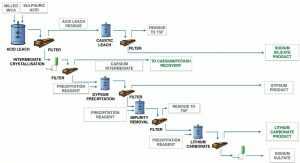 The caesium is a high value product which will be recovered as a formate brine solution. Formate brines are in demand as drilling completion fluids in the oil and gas industries. Only the caesium content of the brine is valued. Rubidium typically occurs in the micas at much higher grades than caesium. No value has been attributed to rubidium recovered in a formate brine. The market for this product will be evaluated during the feasibility study. The process residue contains significant quantities of sodium sulphate and gypsum. The feasibility study will investigate the recovery of these as saleable products. The feasibility study will also evaluate the conversion of lithium carbonate to lithium hydroxide. Greater than 90% of the operating costs have been estimated from first principles based on quoted pricing. The lithium-mica concentrate purchase price of US$350/t is based on the forecast price for spodumene which is $500/t (source: Roskill) but adjusting for the lower grade of the lepidolite concentrate (4.5% Li2O vis 6% for a typical spodumene concentrate). This does not account for the lower capital and operating costs associated with the simple lepidolite concentrator compared to a typical spodumene concentrator which would result in a further discount of the cost. Furthermore pricing of an existing mined lepidolite feed source has been obtained from a supplier in Europe. The total cost of delivery to Kenora falls below the $350/t used in the Study. The total cost of delivery includes the quoted purchase price from the supplier, concentration costs and transport costs. Of the consumables costs 67% is attributable to sulphuric acid and caustic soda (for production of sodium silicate). The consumables costs and consumption rates are summarised in Table 5, following. Processing costs (other) includes personnel, maintenance parts and laboratory analytical services. Applying the above costing to the DFS throughput planning parameter of approximately 29,000 tpa, indicates an estimated Consumables unit cost of around US$285/t of concentrate feed. General and Administration includes all functions required to support the Project independently including management, marketing, safety and security and insurance etc. The key parameters for the Phase 1 L-Max Project are summarised in Table 6. The cost of production has been calculated on both a by-product and a co-product basis, for the latter that is: costs for lithium and by-product production are divided proportionately between products based on the ratio of commodity prices. The targeted C3 cost ranges above include mining royalties (included in the concentrate purchase price), depreciation and amortisation, Corporate Income Tax (at 25%), and an allowance for Corporate overheads. The taxation schedule allows for the free cash flow from the Project to be allocated to non Project-related Corporate activities for example, exploration and the development of a full-scale L-Max® plant which the Company is planning to implement from 2020, once full cash flow is established from the Phase 1 plant. A comparison of these cost targets for the Project with Roskill’s 2016 industry cost curve in Figure 2, below. The comparison shows that L-Max® is expected to be cost competitive even at the Phase 1 scale. At a larger scale, the Company would be targeting further reductions in C3 costs on a co-product basis to approximately $3,000/t – which would place L-Max® projects comfortably in the lowest cost quartile.